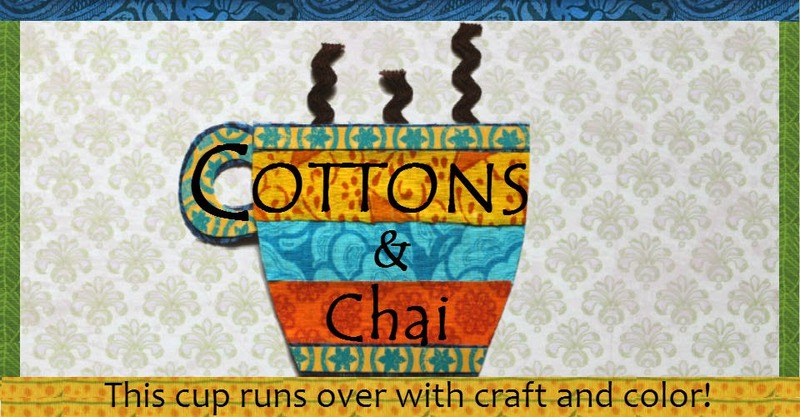 Cottons & Chai: A Very Happy Diwali Bunting! Diwali is one of the most bright and colorful festivals in India. The very thought of Diwali brings to mind a row of oil-lit clay diyas (lights) and the quintessential rangolis (patterns made on the floor with colored sand). 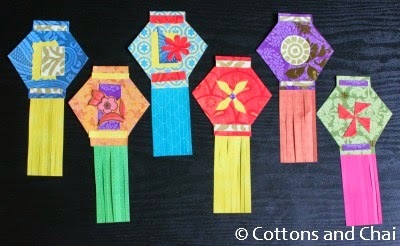 Of course, what would Diwali be without the 'kandils' or paper lanterns! In fact, kandil shopping is an endeavor in itself, an outing to the marketplace to be enjoyed by the whole family - with rows upon rows of multihued, tinseled, shiny kandils on proud display at local shops. (Yes, even 'themed' kandils, drawing from that year's blockbuster!) And that's how all the houses on the street and balconies of apartments are dotted with paper lanterns for everyone to see and admire. However, crafty family that we are - no kandil shopping for us, mind. 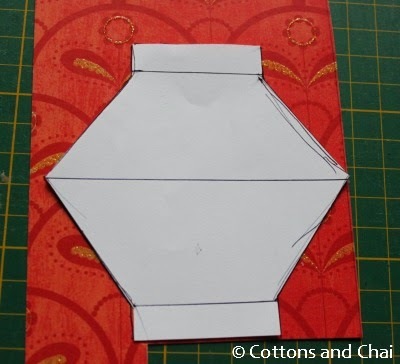 Every Diwali since I can remember has involved a trip to a nearby stationery store for us kids to gather supplies of kite paper, gelatin paper, gold paper etc to make the paper lantern with a little help from my incredibly creative parents. This Diwali I decided to forgo the big kandil and make a pop of colorful little ones to string up at our front entrance. No trips to the stationery store required either - I've stocked up on some wonderful, wonderful card paper from Joanns, and that is what I used. I started by drawing a simple but very traditional kandil shape on a piece of paper and then tracing the outline on one of the card papers. 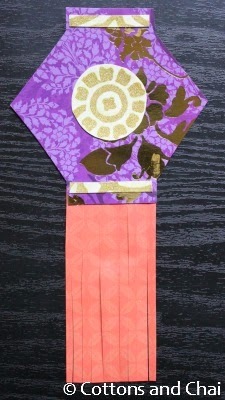 Then I cut a rectangle from contrasting paper and made long cuts about a 1/4" from the top to create the tassels. 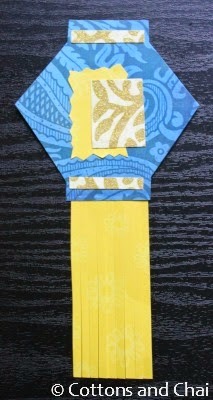 Next I cut out a design pattern again from contrasting yellow paper to decorate the lantern top. 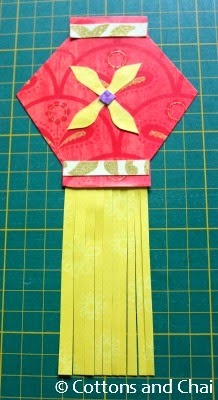 After I stuck the tassels to the bottom back edge of the top shape, my first kandil was all done! .... and then a few others! Then I stapled them onto a length of ribbon, and here is the colorful bunting hanging on our front door, giving our visitors a warm and bright Diwali welcome! 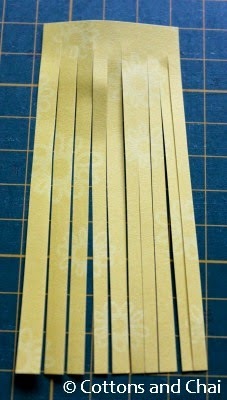 Have you made anything this festive season? Here's wishing you all a great Diwali, full of love and light! Happy Diwali Kashmira and Nupur! That kandil toran looks very beautiful and inviting. I usually make lots of assorted faraal for diwali but don't pay much attention to festive decorating, I will make a toran just like this one next diwali, thanks for the tutorial. Happy Diwali to you and your family too, Priti! Have a wonderful festive season. Happy Diwali! I would love to be in India one day for it, such a beautiful festival to be part of. 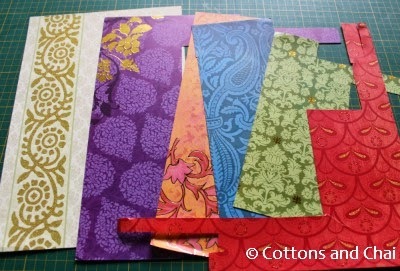 Enjoy your Diwali bunting, you made a great job of it! Thanks! Well I hope one day you do get to visit :)... Happy holidays to you too!